House plants have made a huge resurgence in home decor trends in the last few years (did they ever really go away?) 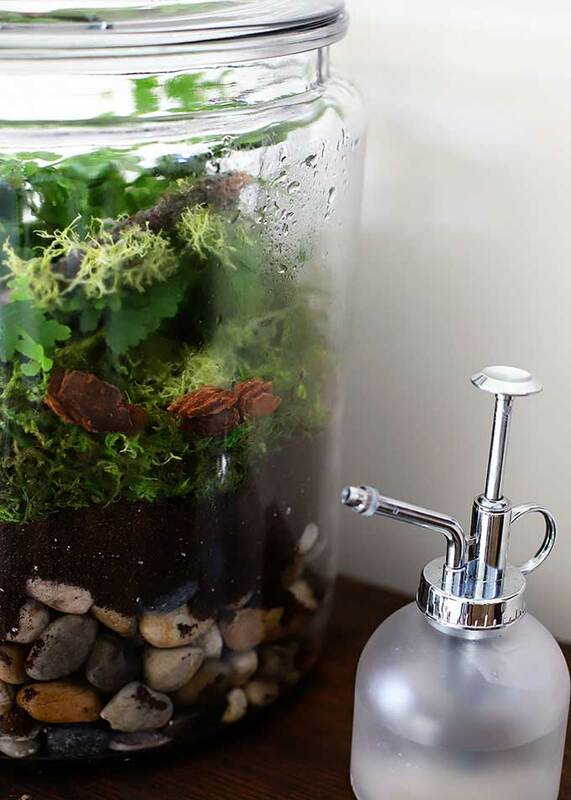 and terrariums are an easy way to get the look without a lot of fuss! 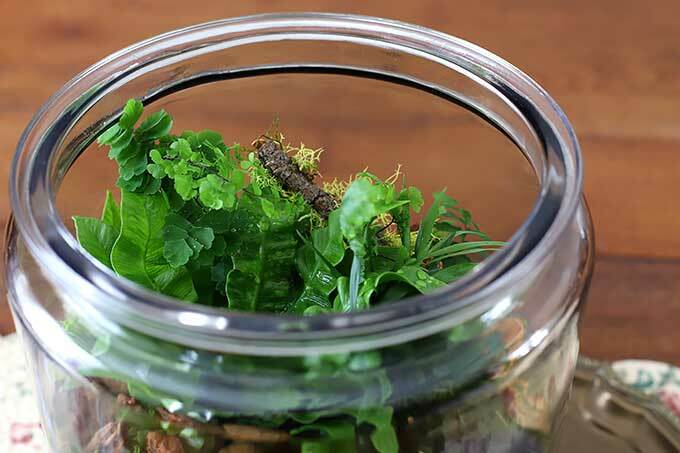 Terrariums can either be closed glass containers or open glass containers. 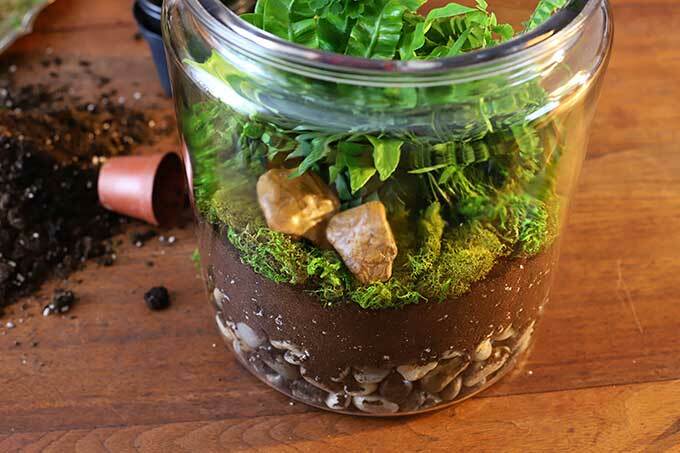 Both types of terrariums are pretty in their own right, but the closed terrariums create their own sort of eco-system in that the soil stays moist and doesn’t require constant watering. The moisture in the soil evaporates due to heat build up in the enclosed glass space, the water vapor condenses on the sides of the glass and falls back onto the plants and soil. The cycle continues again and again. And there’s the whole photosynthesis thing where the plants use the light to create oxygen for their little enclosed world. Bet you didn’t know I was going to go all Sheldon from The Big Bang Theory on you today! The key to making your closed glass terrarium is knowing that plants that enjoy warm moist environments do the best in closed terrariums. Think about it. The soil doesn’t really dry out, it’s constantly getting a steady dose of water from the condensation. You need plants that THRIVE in that moisture (I’ve got a list down below of some great terrarium plants). But all in all, I’m sort of partial to the closed kind because they’re more traditional, so that’s what I am going to show you how to make today. 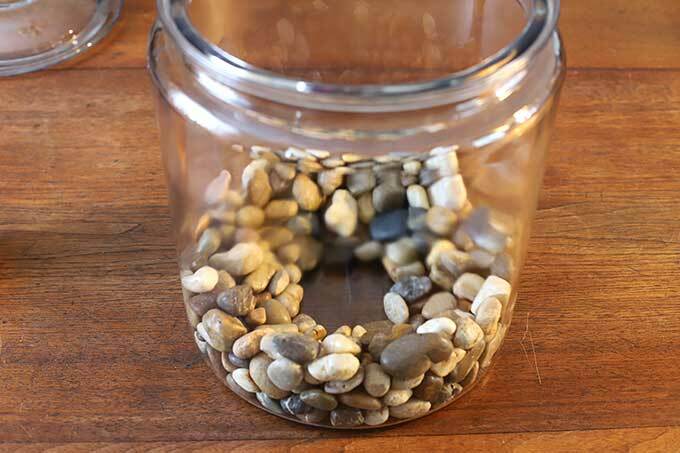 Place your smaller stones around the bottom of the terrarium. You can either fill the whole bottom, or just around the edges. I wanted the stones to have a dominant look, so I built up the stones 4″ around the edges and left the middle bare so more dirt would be available to the plants in that area. 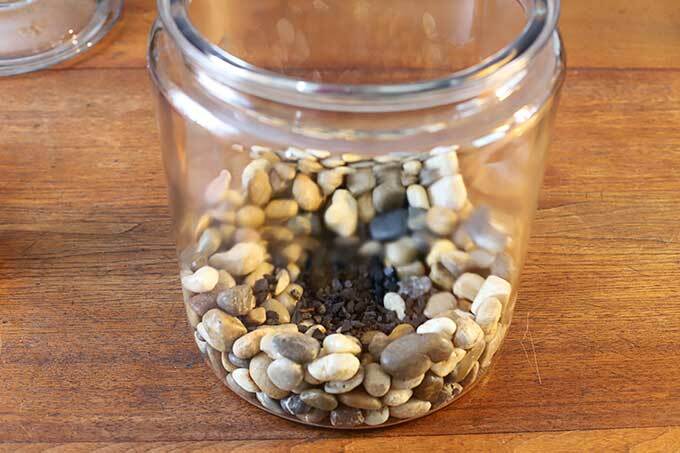 Add about 1″of horticultural charcoal to the bottom of the glass jar. This is to keep bacteria from growing and the terrarium smelling fresh. This is especially important in a closed terrarium. I used enough dirt so the container was roughly 1/3 full. This allows enough room for the roots to spread out and grow freely. 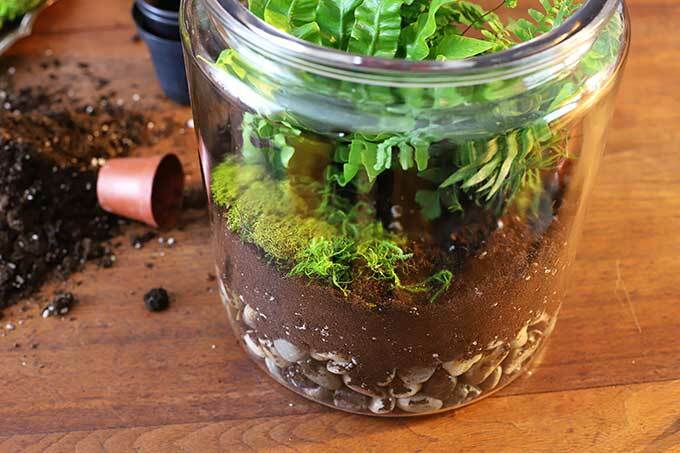 Plant your moisture loving plants in your terrarium. Since I was going to add the bear and some other small items, I left space in the front for those to be more prominent. I put 4 small plants in my terrarium, which may have been pushing it, but I wanted a full looking container from the get-go. I then added moss on top of the soil. And some of the larger rocks. And my bear friend. I found him at Michael’s in the fairy garden section. 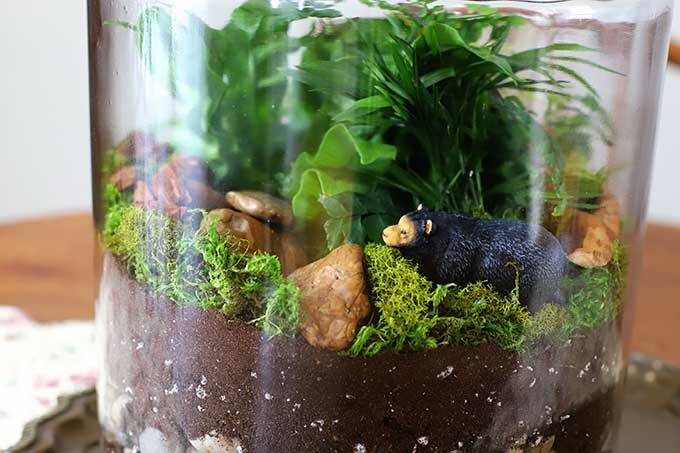 I was going for a whimsical woodland look, so those elements combined with the larger chunky rocks at the bottom of the terrarium gave it a rustic woodsy look! 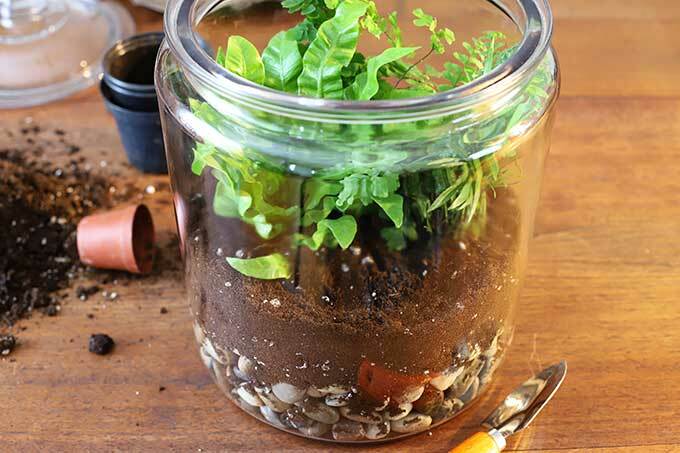 Mist your plants, place the lid on the container and place the jar where it will get light. You want it near a light source, yet not setting on a windowsill where it will bake in full sun. Remember, the closed nature of the container makes it retain heat. In general, you want plants that will remain fairly small (grow to under 12″ in height) and will like the moist soil of terrariums along with the humid conditions. And of course, you want to group plants that have the same light requirements together. BTW, although I love me some succulents, they don’t do well in a closed terrarium because they like to dry out between waterings. Not a lot of drying out happens in an enclosed terrarium. If you want to make a succulent terrarium, use a shallow terrarium with an open top so the plants have good air circulation and have a chance to dry out between waterings. 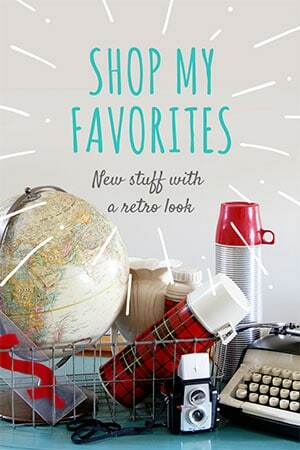 Flea markets and thrift stores are a treasure trove of glass jars and containers if you want to go the inexpensive route. I also find nice glass jars meant to be used as kitchen canisters at the local big box stores. A good rule is to have a container large enough you can get your hand into them to do the planting and not get your hand stuck on the way out. No one wants to walk around with a jar stuck on the hand all day. 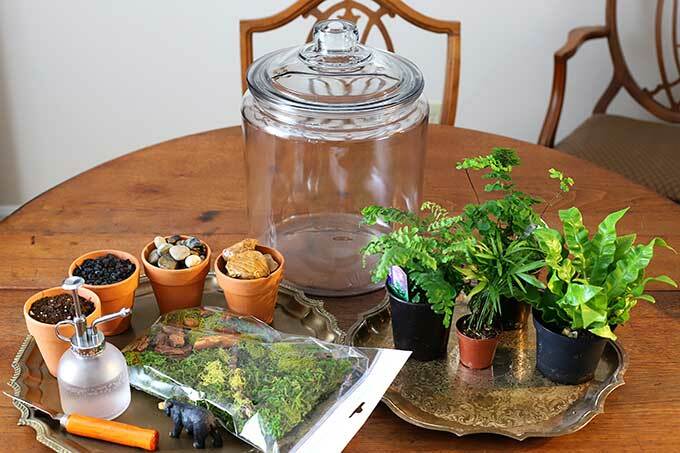 It is REALLY easy to over-water a terrarium. 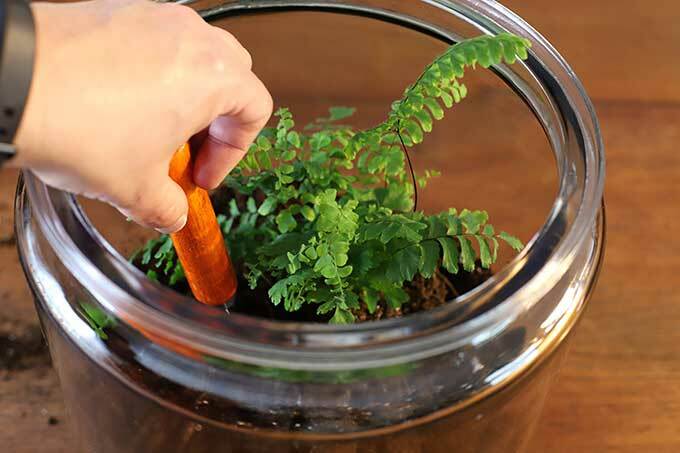 I prefer to use a spray bottle or mister to mist the plants slightly when extra water is needed. My husband bought me this little indoor gardening tool set from Amazon and it came with the cutest little mister and some mini gardening tools perfect for getting into small spaces. 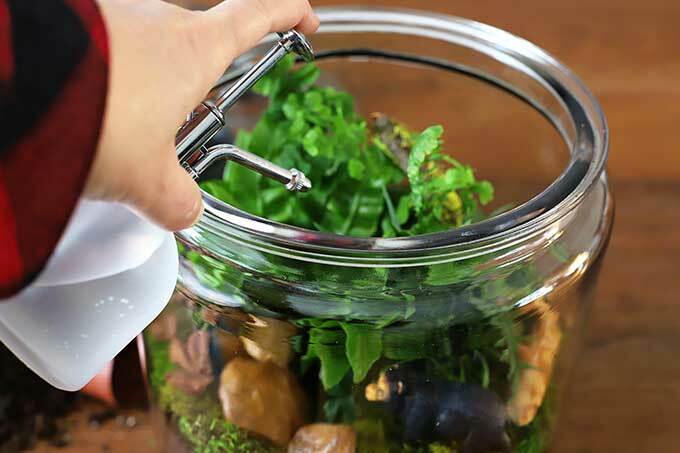 Remember in a closed terrarium you will need to add extra water VERY infrequently. Maybe a little spray once a month or even less than that. Let the soil tell you when to spritz again. If you have over-watered your terrarium you can leave the top off for a few days to release some of the water into the air and dry out the terrarium a little. Beautiful, Pam! Nice to bring a little green into our cold, cold winter! I am inspired! Yes! January has been dragging on FOREVER! I’ll take all the green I can get! 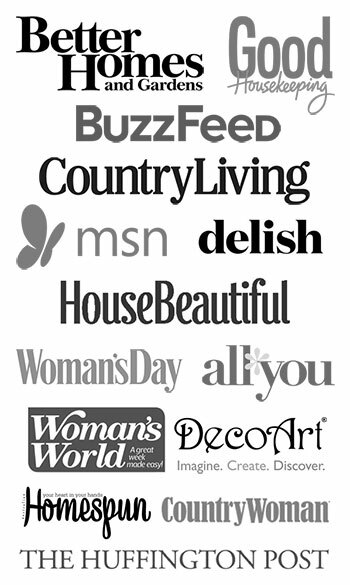 This is a fun project, Pam…love the big container you used! 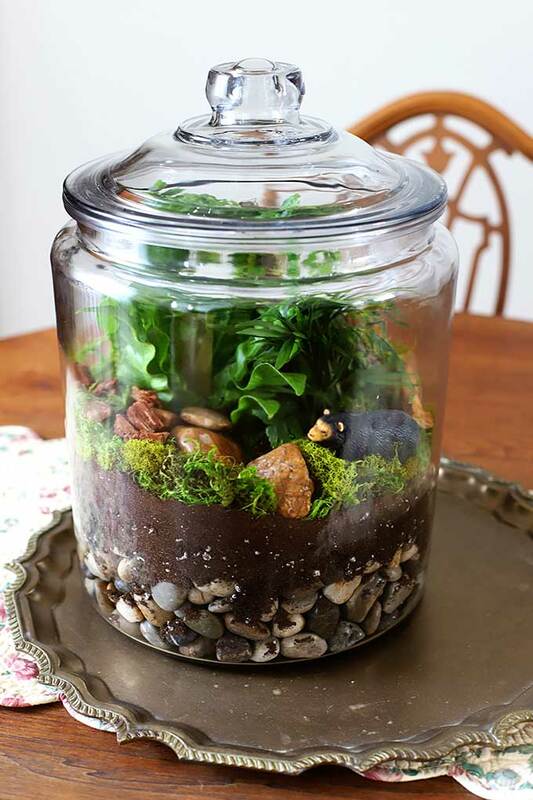 I haven’t had a terrarium since the 70’s…I need to make one again! My mom had a HUGE one that sat on a pedestal. Very 1970’s looking! I kept thinking of that when I was making this one. We had one of those too! Got it as a wedding gift in 1980!! Big round ball thing on a mod white pedestal. I’ve tried terrariums over the years and they never do well. Look good to start, then everything gets moldy, even if I don’t water it. I gave it up! What a lush-looking little terrarium, Pam. 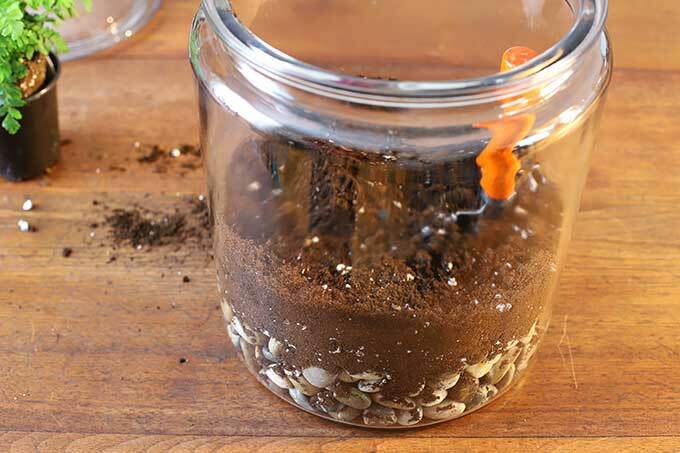 Question: Did you moisten the soil before you put it in the glass jar? Or did you use it just as it came out of a new bag of soil that was somewhat moist? I actually have one of those jars in my stash and have always tho’t it would be good for a terrarium. Maybe now I’ll dig it out and plant it up. I just ordered some horticultural charcoal. I have lots of rocks laying around my house, so pretty much all I need is the plants. I love the look of the ferns and I have tons of moss growing in my driveway cracks! Of course it is under the snow right now, but I won’t let that stop me! Nice post. Thanks for the inspiration! I just put the soil in the jar straight out of the bag. When I popped the plants out of their little pots they came in their surrounding soil was still moist though and most of that went into their “hole” in the dirt with them. And then I spritzed the whole thing after I was done planting. So just make sure the plants you buy are not bone dry when you put them in there, give them a good misting and you should be fine! Ahhh memories are wonderful !! I, too had a 70’s terriuam and love house plants–have several scattered all over the house. I’m jumping on board too and making a terriuam !! Thanks Pam for the memories !! And hope you begin to feel better SOON. 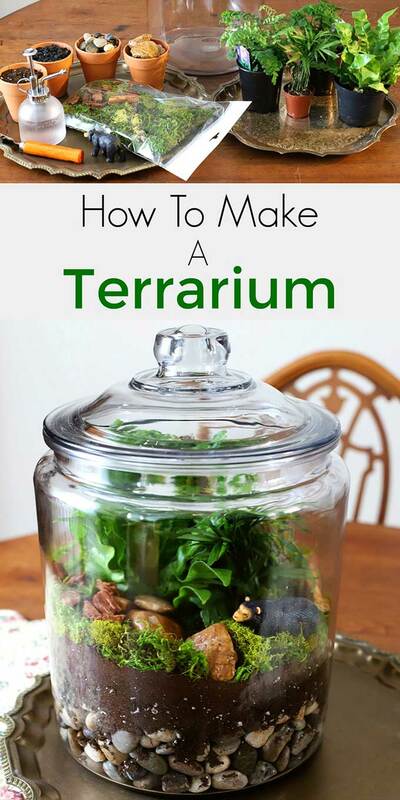 My daughters both love houseplants and terrariums and I think this is just so informative that I’ll share with them! This is such a great idea. I might have to make one of these to satisfy my gardening cravings until spring arrives!